Traditional Balkan Herbal teas and culinary herbs, grown in the pristine environment of the beautiful Rhodopi Mountain region of South Eastern Bulgaria, now available direct to UK, Europe, and USA customers. Please click through the links below to make your selection. Your herbs and teas will be on their way to you in one day or less! Traditional Bulgarian cooking spices and flavourings from Bachkovo in the Rhodopes. It's what gives Bulgarian cooking that delicious flavour! The taste of the Rhodopes, in a packet - click to view. The original refreshing herbal tisane from the Balkans. 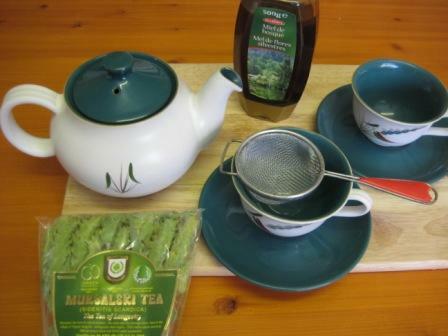 Mursalski Tea (Bulgarian "Viagra tea") has been used for centuries by Balkan people as a refreshing and health giving herbal infusion. A selection of natural wild herbs from the pristine Rhodopi mountain region. All our herbs grow wild in the pure mountain air and are collected by the local folk in the traditional way.